MOKENA, Ill. - June 11, 2013 - PRLog -- Alive Telecom will be providing KPTS-TV a new DTV translator channel 17 antenna. The virtual channel will be shown as channel 8. The 16 bay UHF transmitting omnioid antenna will have a circularly polarized signal specifically optimized for Mobile DTV. The antenna will be enclosed in a fiberglass radome and pressurized per the stations request to help preserve the longevity of the antenna. The antenna will be mounted on a new tower at 430 feet above ground level in Wichita Kansas. The antenna will be over 37 feet long and weight 225 lbs. Each broadcast antenna is designed and manufactured specifically for the customer's channel, coverage and gain, while balancing the mechanical and environmental requirements. This specific antenna Alive Telecom part number ATC-BCC316O-17 is a traveling wave coaxial slot antenna. The new antenna will be rated for 5 kilowatt average input power. The target is to have the station on the air in late August. 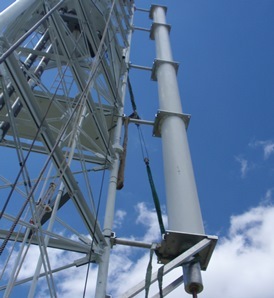 Alive Telecom is excited for the opportunity to provide KPTS with their new antenna.